The lowland Podunajská nížina was ideal for the operation of water mills because of its comparatively bulky streams with adequate inclination and numerous arms. The mill stands next to the Klátovské rameno, the arm of the river Malý Dunaj and it dates to the 19th century. The mill acquired its present appearance in the 1920 reconstruction. Its last owner was Michal Cséfalvay. The mill operated until the 1940s. When the river canal was dewatered, the grand wheel broke down. Thanks to the staff of the Žitnoostrovské Museum in Dunajská Streda, the mill was reconstructed and reopened in 1987 with the aim to demonstrate how it worked. Original furniture and equipment including milling utensils have been preserved inside the mill. The mill is able to operate but the low water table in the arm does not allow it. In difference from other mills on the Danube it has a bricked grinding plant while the wheel and the drive are in a wooden shelter. 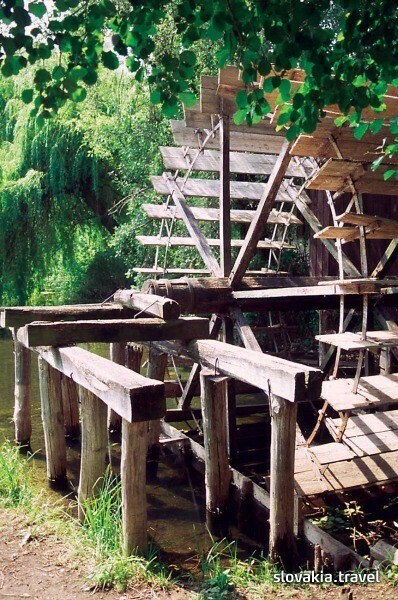 The mill constitutes a nice element amidst the charming setting of the Natural Reserve of Klátovské rameno. Especially nice are the white water lillies.